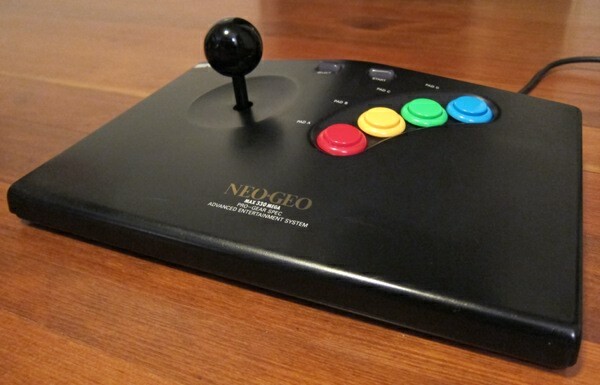 A stock Neo-Geo AES stick that has seen better days. The ball tops and buttons are available in a wide variety of colors. Black and grey are both pictured above because I wasn’t sure which color I would go with. Grey matches the color of the original ball, but I suspected that black would go nicely with my choice of buttons, which I chose to mimic the color scheme of the original arcade units. I purchased these parts through the Paradise Arcade Shop, and paid $2.50 per button and $2.75 for each ball top. Another excellent source of arcade parts online is Focus Attack. Check both to compare prices and color options. Before touching the controller, turn on your soldering iron so that it has time to warm up. To access the controller’s innards, you only need to remove the bottom cover, as all of the components are screwed into the underside of the top cover. There are 5 screws on the bottom of the controller. One is in plain sight, and the other 4 are hiding underneath the rubber feet. Carefully pry up the feet and set them aside, sticky side up so that you can put them back on. Remove the 5 screws and set the bottom cover aside. Close-up of the button assembly, taken after removing the lower half of the case. Before tackling the buttons, this is a great time to remove the ball top. Sometimes the ball tops can be hard to get off, but there is a slot in the bottom of the stick shaft to put a flathead screwdriver blade. This will stop the shaft from spinning when you try to unscrew the ball. You can go ahead and screw the new one on, or wait until you’re done with the buttons. 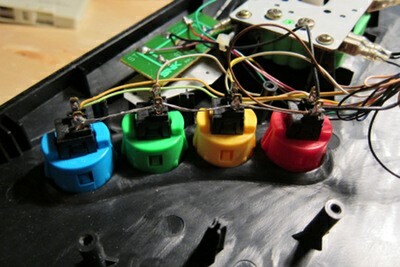 As shown in the picture above, the buttons are all part of one assembly. Before you disconnect anything, take a quick picture of this board that clearly shows the color of wire soldered to each contact (or just write it down). Notice that the board is clearly labelled as to which contact corresponds to which button. 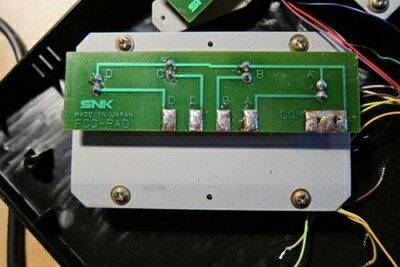 You then need to simply de-solder the 5 button wires and the three grounds (start/select ground, joystick ground, and the ground wire running to the console) by heating the solder until its molten and then lifting the wires off of the contacts. You can then unscrew the 5 screws holding the assembly in place and lift it out. Doing a careful and proper job here will keep the assembly in useable condition. You may, after all, decide that you don’t like the replacement buttons and want to go back to the originals. The button assembly after all of the wires have been cleanly desoldered. You can now snap in the 4 replacement buttons. As shown in the picture below, it’s best to line up all of the contact posts, making it easier to tie the grounds together. Get them oriented before you push them all the way in and they’ll be easier to turn. One in place, they (as one would hope) tend to be snug. The new buttons, snapped into place but not yet wired up. Using either the picture or the notes that you took, you now need to wire up the new buttons. I chose to solder the individual button wires to the top (pictured) contacts, but it doesn’t actually matter. Remember that button D (far left in the picture) has 2 wires connected to the same contact. Once this is done, take a roughly 5-inch piece of smaller-gauge wire and completely strip off all of the insulation. starting with the D-button, feed this wire through the hole on each of the unused (lower) contacts so that it looks like the second picture below. I looped it around each contact post after feeding it through the hole, to help ensure that it stayed in place prior to soldering. Solder the first three (from left to right) contacts. For the last contact, you need to tie together the three grounding wires that you desoldered from the old button board. Solder all 4 wires to the A button contact. Again, take a look at the photo for reference. The signal wires attached to each contact post. Each button tied together with a grounding wire, which is then tied in with the other 3 ground wires. At this point, if you did everything correctly, you’re done. Put the bottom cover back on and secure it with one screw, then plug it into your console to test it. If you have Unibios installed, you can enter the hardware test by holding down B-C-D while the console is starting up, then go to the controller test. If not, just load up a game that uses all 4 buttons. If it isn’t working, go back and check your solder joints and make sure that they are all secure and that the correct wires are going to the correct contacts. If everything works, you can replace the 4 other screws on the bottom and put the rubber feet back on. The finished product. The black ball top looks a lot better, in my opinion. 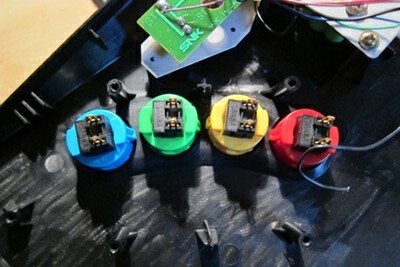 Tagged Buttons, Custom, Joystick, Neo Geo, Replacement, Sanwa, Seimitsu, Stick. Bookmark the permalink.